He is a well-respected litigator and trial attorney with more than 25 years of experience. He concentrates his practice in the field of aviation, products liability, medical malpractice and transportation tort litigation. Prior to entering private practice, Mr. Rosenberg was a program manager and engineer for a major aerospace corporation. In this capacity, he performed design engineering for aerospace vehicles including preliminary, detail and conceptual design work. Mr. Rosenberg was involved with and made many substantial contributions to well-known projects including the Space Shuttle, F-14, A6 and other Navy and experimental aircraft. As a program manager, he directed program and project activities. 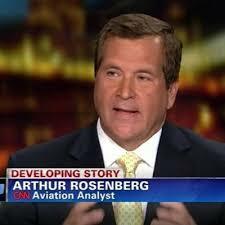 Mr. Rosenberg also holds a commercial pilots license with instrument ratings. Prior to becoming a partner with Soberman & Rosenberg, he practiced aviation law in New York City with the law firm of Kreindler & Kreindler. Mr. Rosenberg left his New York City practice to start his law firm. Mr. Rosenberg successfully combines his substantial aviation, engineering and technical background with extensive litigation and trial experience. He has served on plaintiff liability and general committees in aviation mass disaster litigation including the 9/11 Disaster Cases, the Air Florida Litigation involving the crash of a Boeing 737 into the 14th Street Bridge in Washington, D.C., Air Canada Litigation involving the in-flight fire of a DC-9 airplane near Covington, Kentucky and others. He was actively involved in and represented families and victims of the World Trade Center disaster and victims in the TWA Flight 800 and Swissair disasters. He has successfully prosecuted numerous lawsuits against manufacturers of general aviation aircraft and commercial airliners in the United States. Many of his efforts have resulted in design changes to aircraft and airline procedures to prevent future accidents. He has authored numerous articles including: “Conducting Discovery in Foreign Countries,” Southern Methodist University, March, 1985, Aviation Space Law Symposium; “Death on the High Seas Act – Right to a Jury Trial,” Los Angeles Trial Lawyers Association, 1987; “The Government Contractor Defense,” New York State Trial Lawyers Digest, July, 1991; “Aircraft Manufacturer Liability,” Journal of the Bar Association of Nassau County, December, 1991; “A Military Contractor’s Best Friend,” The Government Contractor Defense, American Bar Association, Aviation Litigation News, Spring, 1992; “Instructions Not To Answer Questions,” Nassau Lawyer, Spring, 1993; Aviation and Space Law Symposium “ Conducting Discovery in Foreign Countries”, Southern Methodist University, March, 1985. 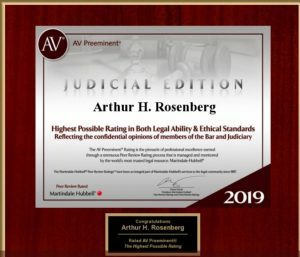 Mr. Rosenberg is a member of the Nassau County Bar Association (Chairman, 1993-1995; Vice-Chairman, 1991-1992, Aviation Law Committee), New York State and American (Member, Aviation Law Committee) Bar Associations; The Association of Trial Lawyers of America; New York State Trial Lawyers Association; Aircraft Owners and Pilots Association, A.O.P.A. Some of the cases he was involved or reported in include: Malaysia Flight 370 (2013); Flores v. ATA, 2003; World Trade Center disaster, 2001; SwissAir MD-11, Flight 111, 1998; TWA B-747, Flight 800, Long Island, New York, 1996; Gruentzig v. Beech Aircraft, 1990; Resnick v. Sikorsky, 660 F.2d 415 (D. Conn 1987); Pan American, Flight 73, Karachi, Pakistan, 1986; Seville v. Southmost, 742 F.2d 786 (3rd Circuit, 1986); Eastern Airlines B-727, Flight 980, La Paz, Bolivia, 1985; In re Air Crash near Covington, Kentucky, 1985; Szatanek v. McDonnell, 1984; Robinson v. Parker-Hannifion, 447 M.E.2d 781 (1982); In re Air Crash near Tazewell, Tennessee, 1982; In re Air Crash near Frederick, Maryland, 1982; In re Air Crash of Air Florida, Flight 90, 1981. He is a member of the New York Bar and admitted to practice before many federal courts throughout the country. He is listed in Who’s Who in American Law, the Bar Register of Preeminent Lawyers by Martindale-Hubbell, the highest rating it bestows on attorneys, and SuperLawyers. He heads the firm’s commercial litigation, tax law and wills, trusts and estates department. Mr. Soberman is graduate of Franklin & Marshall College and received his Juris Doctor from Ohio State University Law School where he was an associate editor of the Law Journal. Mr. Soberman received his Master of Law in Taxation from New York University. He concentrates in litigation, corporate law, estate planning and federal taxation. Mr. Soberman was an adjunct assistant professor at Adelphi University and has served as an instructor at Long Island University. He has been a frequent lecturer on a variety of topics to professional groups including the First District of the New York State Dental Society, New York State Society of Certified Public Accountants, the Greater New Jersey Estate Planning Council, the C. W. Post Tax Institute and the Fairleigh Dickinson Tax Institute. He has authored articles for New Jersey State Bar Journal, the CPA Journal, The Tax Adviser, and the Journal of Pension Planning and Compliance. He is a member of the New York, New Jersey, Florida and federal Bars, the New Jersey Bar Association and the Pension Council of Long Island. Josephine attended St. John’s University School of Law, graduating in 1987. She is engaged in the practice of law with an emphasis on Elder Law, Trusts and Estates, Real Estate and Guardianships. Ms. Doyle is a member of the New York State Bar Association and Nassau County Bar Association. She has served as a Small Claims Assessment Review Officer for Nassau County and Small Claims Hearing Officer for Queens County. She has also represented a major airline in labor relations matters. David graduated from Columbia Law School in 1989 and New York University School of Law in 1991 where he received his LL.M. in Taxation. He concentrates in the areas of commercial litigation, corporate and tax law. Before becoming counsel with Soberman & Rosenberg in 2004, he was associated with Pryor Cashman Sherman & Flynn, LLP and Meltzer Lippe & Goldstein, LLP. He is an active member of the American Bar Association and Nassau County Bar Association.